This is a pair of nice brass decorative strap covers of bridal brasses, antique horse brass, or buckle. Both are included in this sale, these are old, and may be made to add decoration to a harness or bridal, not sure, but these two came with a group of horse tack items we have purchased all are hard to find items, many are unique in the way they were made. 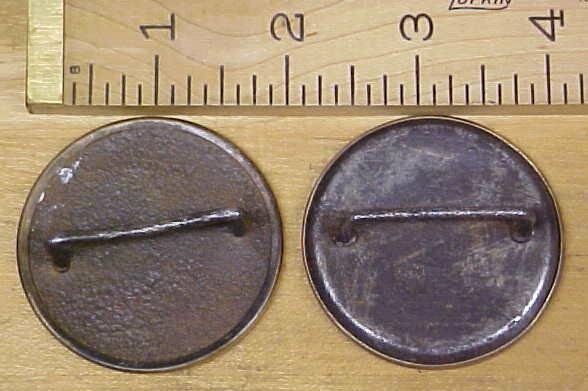 These for example are brass on the outside, and steel on the inside part. The steel or iron has had some pitting on it, but is not rusty now. As you can see there is some dings, and dents, a few scratches, but from a distance will still serve the purpose. 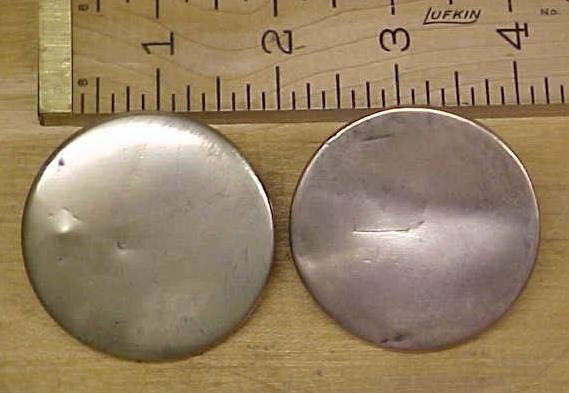 Each 1/2" thick x 2" diameter. The loop on the back is designed to allow a leather strap up to 1.12" wide to past through, and thickness of the straps can be up to 3/8" to fit. A very hard to find early 1900's era decorative strap brass! Price is both as shown in the pictures. These are all we have of this type, never seen likes of these before. Don't miss out. Items Similar To "Antique Horse Harness Brass Decorative Strap Cover"